Ship shapes inform the architecture of this compact Block Island vacation house. A hull-shaped roof shelters the top-side bedroom. Circular decks sweep 270-degree views—south to the Atlantic, west across Rodman Hollow toward Montauk, and north to the Connecticut shore. From afar the house has the character of an ark moored to a hillock; scuppers and cable rails underline the nautical theme. The siding, a weathering rainscreen of vertical cedar boards, attaches to continuous horizontal drip trim boards that also organize openings and railings. The three floor levels have simple plans with minimal walls and ample windows to maximize internal openness and outward views. The entry hall opens onto the staircase, bypassing guestrooms and sleeping deck. 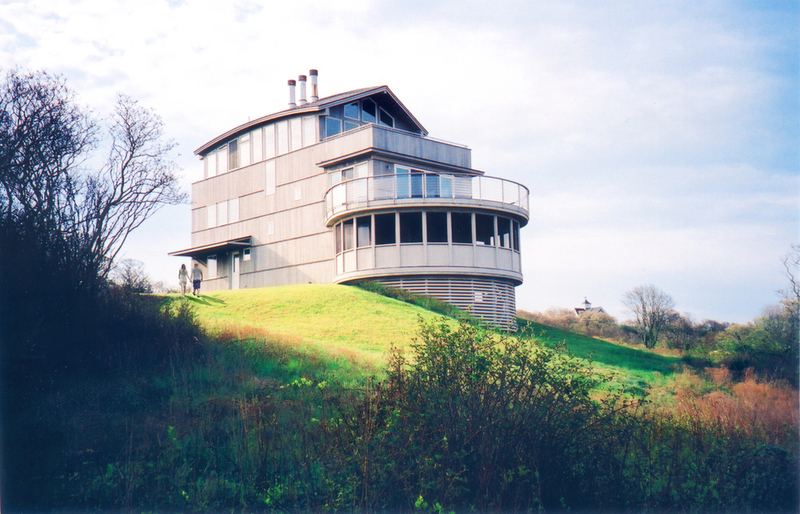 The middle floor is loft-like with living spaces extending onto the circular sun deck. The top floor suite offers panoramic tree-top views from the bedroom suite and outdoor deck.